Eunice Olina Hinshaw1,2,3,4 [Ola Hinshaw1,4,5]. Born Jan 11 18781,3,6 [Jan 11 18794,5,7, Jan 1 18782], Halstead, Harvey County, Kansas1,3,6. Dea Alice Murray, born Mar 26 1901; died Feb 17 1984; married (1) Robert A. Hopper, (2) Leo H. Mahler. Oris Linn Murray, born Apr 13 1909; married Ann Berger. 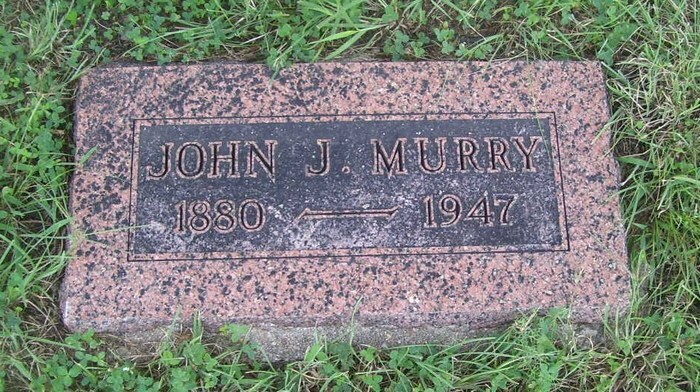 Murry, John J., head-of-household, age 39, born in Kansas; father born in Pennsylvania; mother born in Illinois; owned home (mortgaged); occupation: proprietor, produce co.
Murry, Ola, wife, age 41, born in Kansas; father born in Indiana; mother born in Ohio. Murry, Dea, daughter, age 18, born in Kansas; parents born in Kansas; attended school. Murry, Orris, son, age 10, born in Kansas; parents born in Kansas; attended school. Murry, John J., head-of-household, age 59, born in Kansas; completed 1 year of high school; on Apr 1 1935 was living in the same house; owned home ($3000 value); occupation: salesman, creamery; worked 52 weeks in 1939; $1200 wages in 1939. 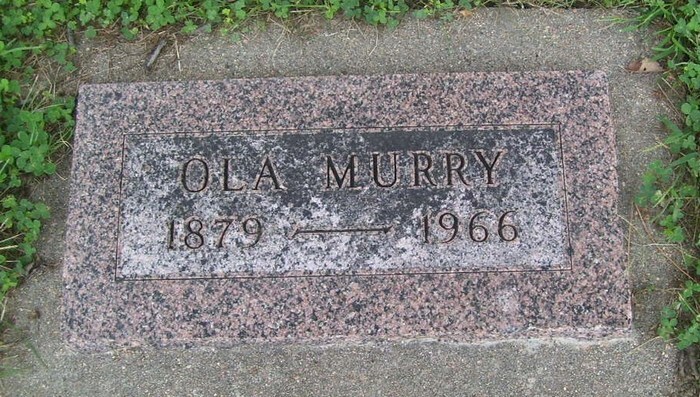 Murry, Ola, head-of-household [sic], age 61, born in Kansas; completed 2 years of high school; on Apr 1 1935 was living in the same house. Murry, Orris, son, age 31, born in Kansas; completed 4 years of high school; on Apr 1 1935 was living in the same place/city; divorced; occupation: bookkeeper, creamery; worked 36 weeks in 1939; $540 wages in 1939. Hopper, Dea, daughter, age 39, born in Kansas; completed 3 years of high school; on Apr 1 1935 was living in the same place/city; divorced; $0 wages in 1939, plus other income. U.S., Hinshaw Index to Selected Quaker Records, 1680-1940; http://www.ancestry.com. 1880 census, Halstead, Harvey County, Kansas; roll T9-0382, ED 239, page 505D, line #7, dwelling #29, family #31. 1920 census, Halstead, Harvey County, Kansas; roll T625-534, ED 48, page 9B, line #72, dwelling #244, family #248. Contribution from Terri Overman (). 1940 census, Halstead, Harvey County, Kansas; roll T627-1234, ED 40-8, page 10B, line #67, household #221. 1920 census, Halstead, Harvey County, Kansas; roll T625-534, ED 48, page 9B, line #76, dwelling #245, family #249. 1920 census, Halstead, Harvey County, Kansas; roll T625-534, ED 48, page 9B-10A, line #48, dwelling #251, family #255. 1920 census, Halstead, Harvey County, Kansas; roll T625-534, ED 48, page 10B, line #55, dwelling #268, family #276. 1920 census, Halstead, Harvey County, Kansas; roll T625-534, ED 48, page 10A, line #2, dwelling #252, family #257.